Music lessons for all ages, all styles in South Austin. 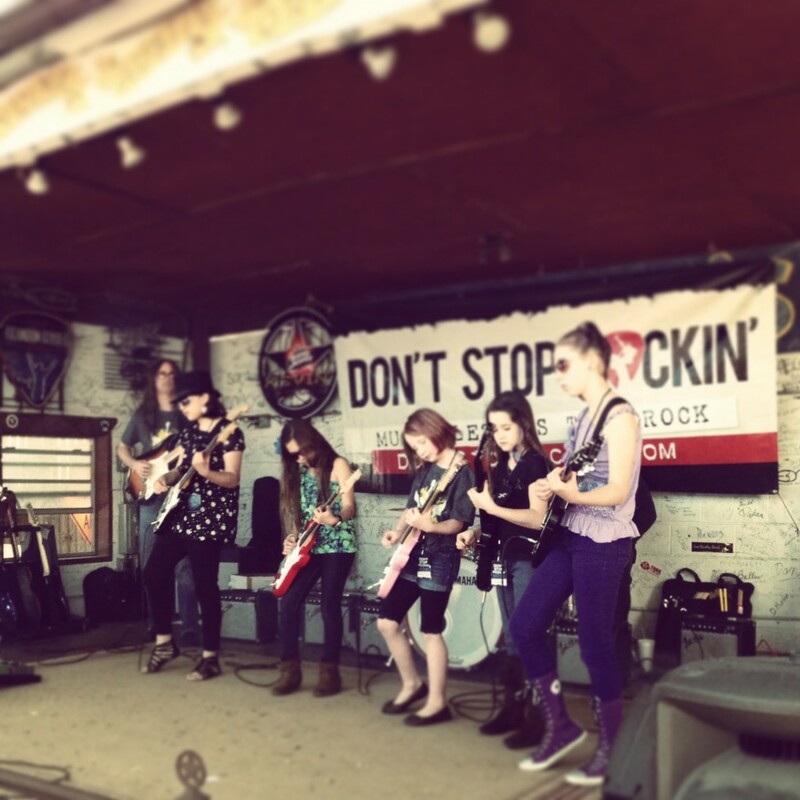 Don't Stop Rockin' - Music Lessons That Rock - All Ages! Our Group Guitar program is a school year rock guitar program that spans nine total sessions, three per year, Rock 101 – 901. The program starts off with the most basic introduction of the guitar and ends with rockers being able to play barre chords and shred solo’s. Imagine learning to play guitar and to ROCK in a fun, interactive environment. Our unique approach uses technology to incorporate video, audio, and graphics. Each student receives a custom supplemental hand-out for each of the 11 weeks, which covers the main sections of the lesson, not to mention plenty of instruction with a maximum of 6 students per class. In addition, the lesson is supported weekly with an online review video that continues to build on what they have learned. We have three, 11 week sessions per school year; Fall, Winter and Spring. At the end of each sessions 11 lessons, we put on the legendary BIG show, where each child has the opportunity to perform live, full band at a music venue – it’s totally sweet. 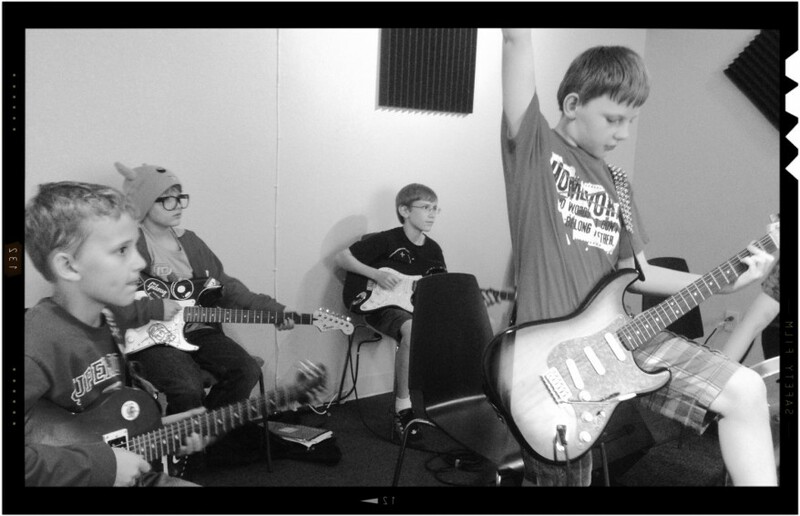 Tuition for our group programs (guitar, vocal and band) are drafted every three months. We will send you a courtesy reminder of specific draft dates a couple of weeks in advance. If you wish to split tuition over two payments, you will need to notify us of this by emailing james@dontstoprockin.com at least seven days before the draft due dates. Traditionally, a handful of students sit in front of a teacher who demonstrates how to play music by using their guitar and sometimes a chalkboard, or flip pad. In contrast, each of our lessons have been painstakingly built and tested over the past several years, using the most high tech software and equipment available, and then presented in high definition. We understand that most modern children need to be engaged and inspired in order to learn. This is why we have created an experience, not just a lesson. We focus on on a learning experience that emphasizes the emotional connection to the music while conveying music theory in order to ensure a balance of theory and pure rock. We initially concentrate on getting the Rockers to be able to play chords quickly, which means within just a couple of weeks they know enough to play hundreds of songs and to jam with you too! Through the journey of mastering their guitar, we help each student find their inner rocker, as well as a clear understanding of what ROCK is, and as importantly, what ROCK is not. Each session the Rockers will learn a variety of tunes from different eras. In order to develop an acute sense of each ROCK movement, they will follow the path that ROCK has taken from inception through today. They will be having you dust off your vinyl in no time for some parent / rocker listening sessions! Is this the right program for my child? 95% of the time, YES! We’ve had many children go into their 6th, 7th, 8th and even 9th session of Don’t Stop Rockin’ after coming to us with no obvious inclination towards music or learning an instrument to start with. The lessons are designed to be fun and fit the learning style of the modern young person. Those that come into the program with a musical background or an interest in music in general LOVE the experience. Occasionally, the group dynamic doesn’t suit everyone and every learning style and if this is the case we will direct you to a different class type or private lessons. Don’t Stop Rockin’ Group Guitar is reserved for children ages 9 and up. Even though there are certainly exceptions, we see the most success when children join the group program once they are at least 9 years old. If they are under 9 (or prefer a private lesson experience where they can learn any genre of music they would like and go at their own pace) please see our private lesson page for details. One of the major factors of developing and keeping the student interested in playing music is being able to practice and play music they enjoy. If your child prefers listening to classical music or piano based music then piano is probably the best choice. If your child is more interested in listening to Pop, Rock, or Country music where guitar generally plays a larger role in the song then this program would be a good fit. We use electric guitars in the class (so we can control volume and tone). They are certainly able to practice at home on an acoustic guitar if they have one, but not in the group guitar program. Amps and cables are provided for the group lesson. 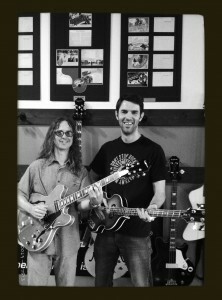 We can rent you an electric guitar (when available) for $35 per 3 month session. They get to take it home and bring it to class each week. For 9 year olds, we suggest considering a 3/4 scale electric guitar. For 10’s an over, a regular full size. Unless you put them side by side, it’s hard to notice any difference. It is a good habit to schedule practice time just before something else that they really enjoy, like screen time or a treat. We don’t require your child to practice a specific amount of time each week to be able to understand or take the next lesson, however it will certainly be beneficial. The more they practice and progress the more confidence they will gain each week. Each lesson is supported twice. They will receive a customized handout containing each sessions material, at the start of each new session. We have created a fun, educational & totally rockin’ weekly review video to support each class, which contain the main principles that we learned that week. The videos are posted on our webpage and you will receive an online username & password at the start of the program. What if we miss class? The online reviews contain all of the information from the week’s class, so your rocker can keep up to date from home. However, if they would like to schedule a 30 minute private lesson with an instructor (where available) you can, for the totally reasonable additional cost price of $15. You will simply need to email james@dontstoprockin.com to request a lesson time. What if we have to drop? Please remember our group guitar, vocal and rock band programs are school year programs and we expect that each student will be with us for the duration of each school year. Leaving mid-school year negatively affects the rest of the group, just like if they were on a sports team and stopped mid season. If your rocker has to stop, the summer is the best time as it affords us the opportunity to find replacements for the following school year. If the draft date for a session has passed (three weeks before the next one starts) and we have already drafted your account, you will not be eligible to a refund. We will however add a credit to your account which can be used for future lessons, group, private or camps. This credit is transferable to different students. No refunds or credits will be given if you miss a lesson. We post our entire school year program, including performance dates on our live calendar in early August of each year. Can I or a family member sit in on a class? No. There’s not much additional room in the class, other people are a distraction and let’s face it, your face will likely melt. There’s a window in the door so you can check in as and when you wish to. What songs to do you teach? The songs we learn are classics from Elvis to Green Day; Led Zeppelin to the Beatles. Almost all of the rockers have heard these tunes at some point. We feel that it is essential to introduce and explain the cultural influence of music on our society by exposing them to bands and songs that have changed the course of history. Do I have to stay during the class? Nope. You are welcome to drop off and run errands. Don’t forget you can kick back in our lobby, check email or just hang out with your other kids. You may ask for the Rocker’s autographs but only after class please. Why should my kid rock? Middle school and high school students who participated in instrumental music scored significantly higher than their non-band peers in standardized tests. Through the application of guitar and ROCK, we strive to build self-confidence that our rockers will carry with them wherever they go in life. Our groups have a maximum of 6 students, with two instructors per group to ensure that each and every rocker has the opportunity to receive individual attention. The group environment encourages camaraderie and friendship with their peers. At the end of the semester, the rockers get to experience The BIG show which is a live, full band performance with their group, in front of friends and family at a local music venue. Our feedback has shown that this experience can actually be life changing for them! Our philosophy is simple: make it fun and they will learn! 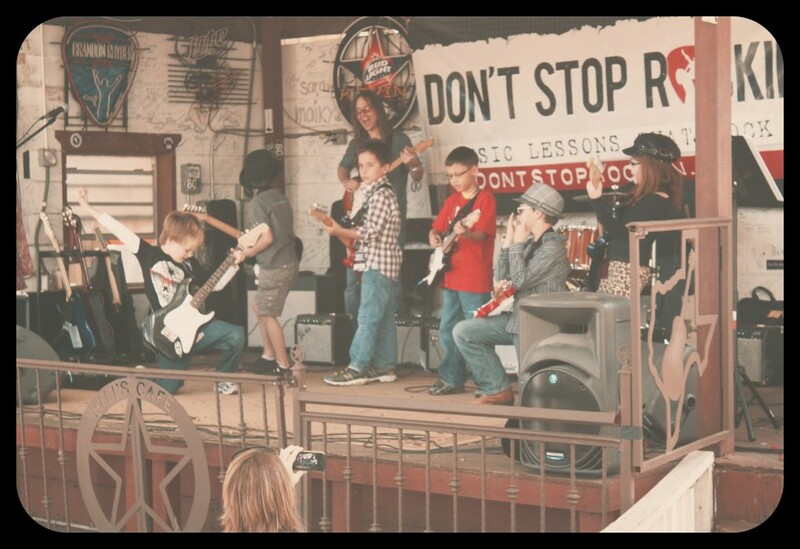 Whether you are 5 or 85 Don't Stop Rockin' is the place to take music lessons. While we specialize in group rock guitar for ages 8 and up (and adults), we also teach private guitar, piano, voice, group voice, bass and drums for all ages. In private instrument lessons, you can learn any style of music you like, from classical to pop; jazz to country and of course sweet, sweet Rock and Roll! Copyright © 2011 Don't Stop Rockin'. All Rights Reserved.